It was up above Moab, Utah I first made this Sand Flats smoked chicken recipe. 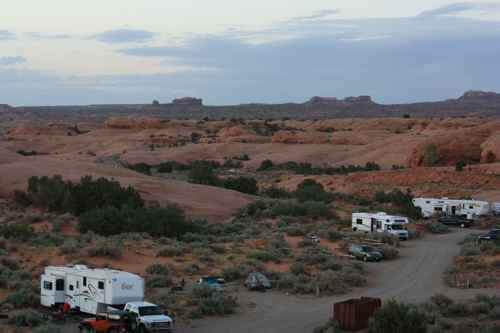 I was camping at the Sand Flats Recreation Area, just a stone's throw from the famous Slick Rock Trail, loved by bicyclists and motor sports enthusiasts alike. There once was a time I could ride the entire Slick Rock trail on my mountain bike. Once, I rode it two times in a single day. Nowadays I'm out of shape, and can only dream of riding that trail. But I can still cook a mean chicken! I climbed the sandstone dunes behind my campsite one evening. This is the view from above. It's beautiful country. Rocky sandstone formations, blowing sand, cactus and the cryptobiotic crust on top of the sandy soil. Interesting and awe inspiring. 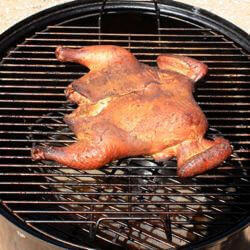 This smoked chicken recipe cooks a little quicker than your typical smoked whole chicken recipe. The backbone is removed from the chicken. I use kitchen shears, but a stiff, sharp knife will work- just cut through the bones on both sides of the backbone, then press the chicken flat. 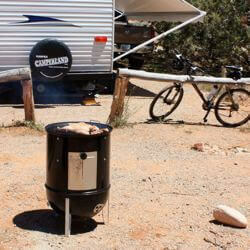 I use my Weber Smoky Mountain smoker when traveling with my RV. A single filling of charcoal briquettes in my charcoal chimney is just enough for one or two whole chickens. Make sure the charcoal is completely ashed over before adding to the smoker. A few chunks of apple or hickory wood gives the chicken the right touch of smoky flavor. Smoker wood chips work too, but to prevent them from bursting into flame, wrap them inside foil packets before tossing onto the charcoal. Fill the water pan half full of hot water before placing the chicken in the smoker. Combine the smoked chicken rub ingredients. Rub the chicken with oil, then generously season it on all sides. Gently separate the skin from the breast and sprinkle some seasoning between the skin and meat. That's a trick that adds awesome flavor to the breast meat. Chicken smokes best at around 300 degrees Fahrenheit. It will take around 1 and 1/2 hours to cook at that temperature, and the skin will be brown and crispy. When the internal temperature of the thigh reaches 170 degrees, it's done.